Our guestrooms are designed so you won`t forget that that you are staying at one of the top beach hotels on St. Kitts. 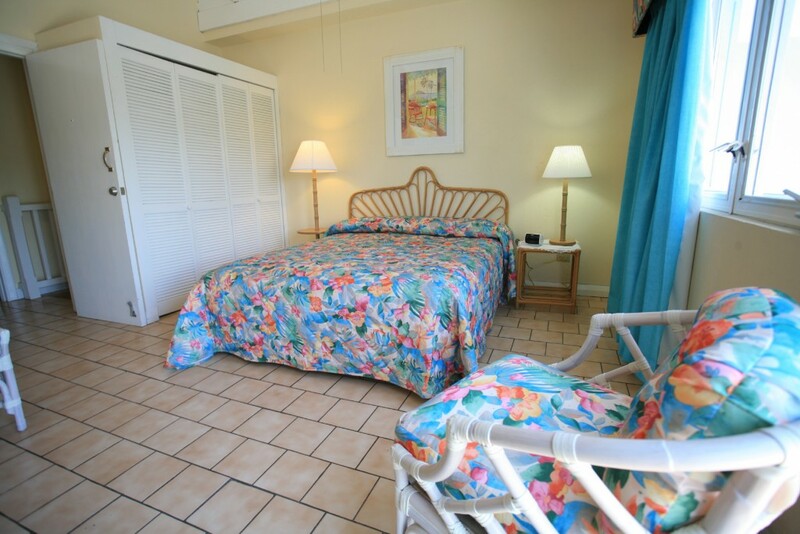 The guestrooms offer stunning views of the Caribbean Sea or tranquil back lawn, colorful and attractive décor and a spacious layout to accommodate the many needs of our guests. We want to make sure all our guests have a chance to embrace what makes St. Kitts so magical. From the balconies attached to all but our Mountain View Rooms, you can not only see the ocean, but also immerse yourself in vibrant Caribbean sunsets and occasionally even rainbows. 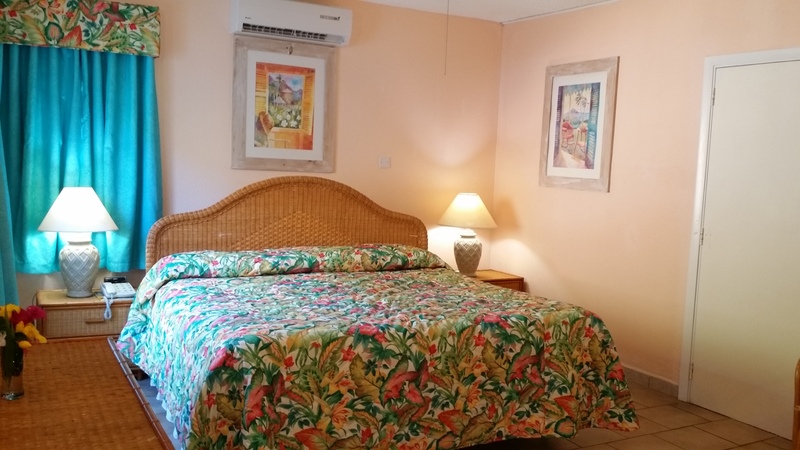 Our most deluxe accommodation, these modern comfortable rooms are ocean view and contain a walkin Kittitian Rainforest Shower and newly remodeled kitchens with granite countertops. The separate bedroom is spacious. The ocean view living/dining room is furnished with an upholstered sofa and matching chair in tropical sunbrella fabrics, coffee table, end table, lamp, dining table, four chairs and two bar stools. Prints featuring scenes of St. Kitts by well known English Kittitian artist Kate Spencer are displayed in each room. The new kitchen is complete with a stove top, microwave / convection oven, toaster, tea/coffee maker, sink, full size refrigerator, dishes, glassware, flatware, utensils, pots and pans. 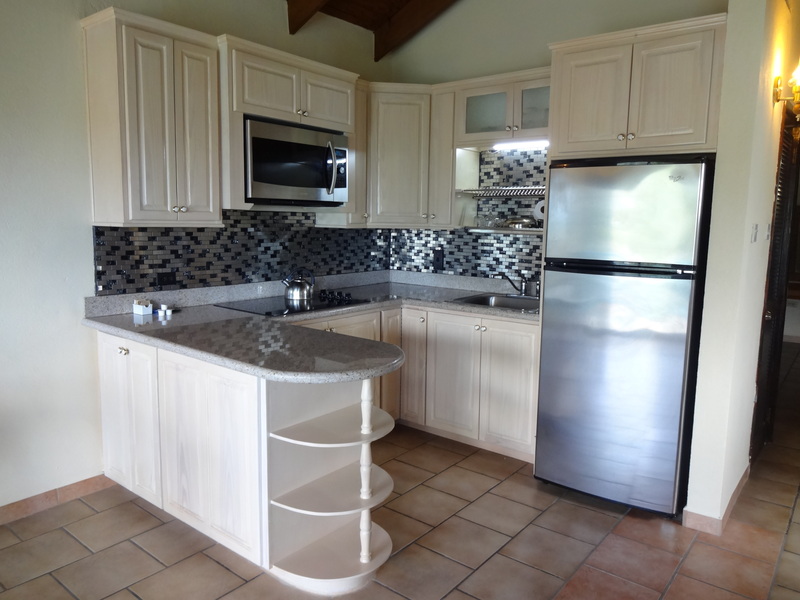 All appliances are stainless steel and the countertops are granite. 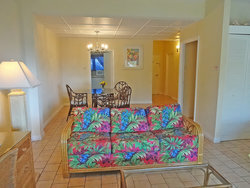 The two main rooms measure 800 square feet and the spacious balcony measures an additional 100 square feet. 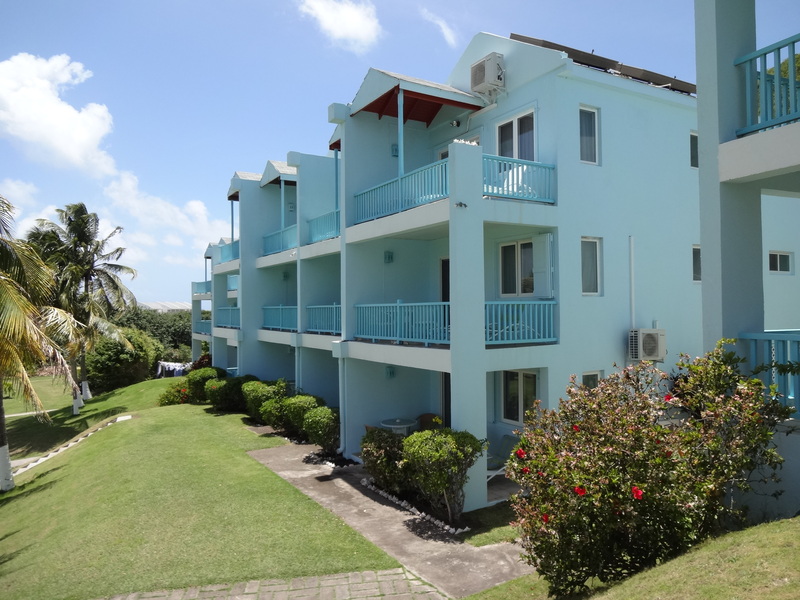 The attached balcony, accessible via sliding door, is thoughtfully furnished with two comfortable chaise lounges as well as a table and chair set allowing for Kittitian living the way it is meant to be. 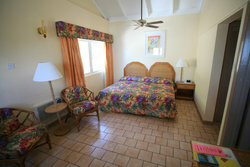 All rooms feature Free Wi-Fi, premium channel cable TV, air conditioning, hairdryer, clock radio, iron and iroing board. - Daily Maid Service is included. Enjoy Island Life the way it is meant to be! 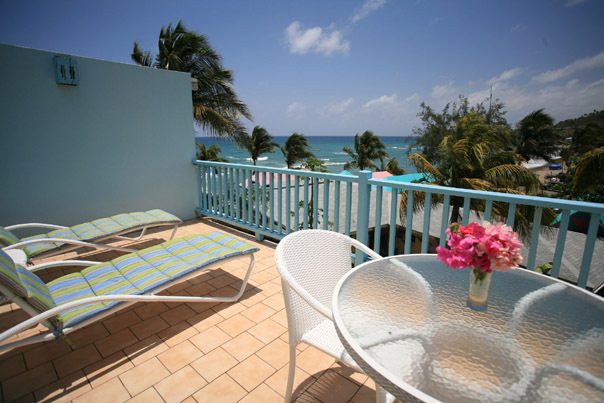 One Bedroom Suite Balcony - Spacious One Bedroom Suite balconies at Timothy Beach Resort add a whole new dimension to your Caribbean vacation experience. 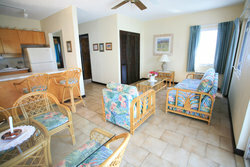 Furnished with two extra long chaise lounges and a table and two chair dining set, this is island living at its finest! 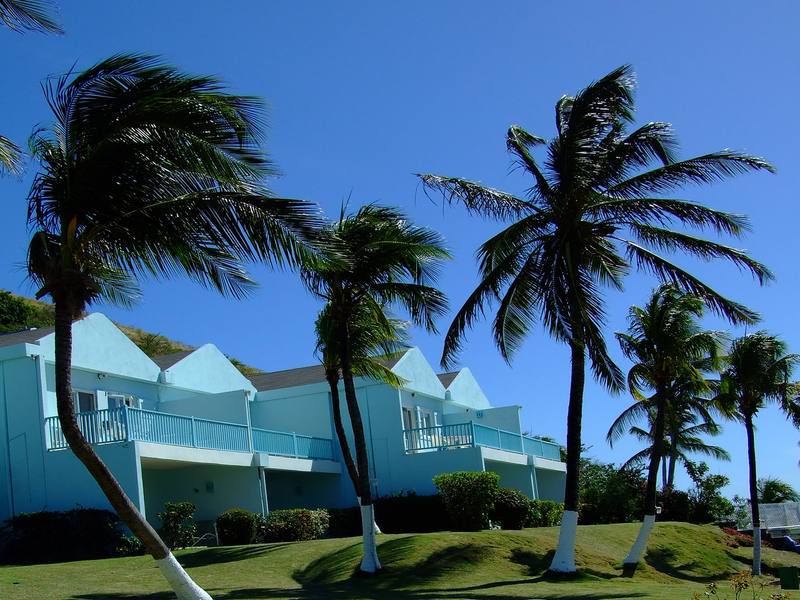 You may bid adieu to a day of advaneture by relaxing and having cocktails on your balcony in the evenings while viewing the sunset over the Caribbean Sea. You may also choose from dining in air conditioned comfort or enjoy an alfresco dining experience or on your own balcony. Enjoy the deluxe features of a walk-in shower with granite countertops, fine North American hardwoods, tropically hued impored Spanish tiles and upscale nickel plated faucets and fittings. The slip resistant pebbled flooring of the shower will make you feel you are truly in a rainforest. Our One Bedroom Suite Kitchens are newly remodeled with granite countertops & stainless steel appliances. With all we have to offer, it's nearly impossible to not wish to stay longer! Modern comfortable room facing the lawn and Timothy Hill where vervet monkeys may often be seen frolicking before sunset. 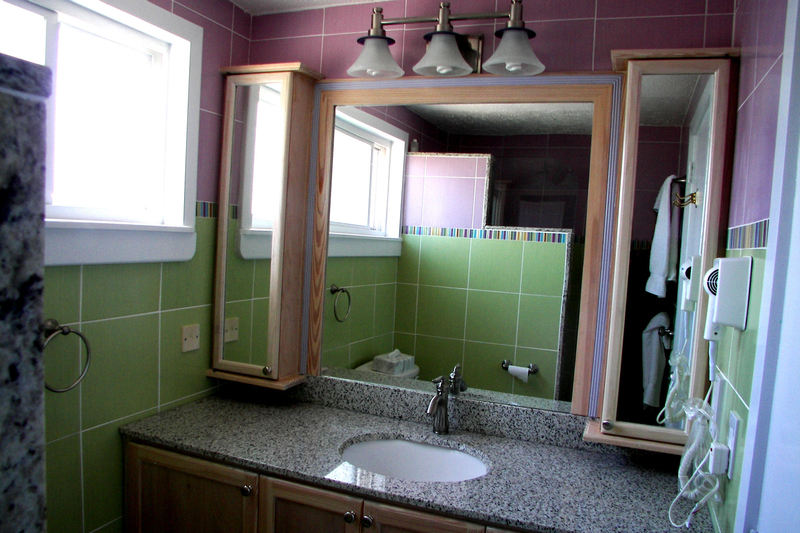 This is a standard room measuring 277 square feet with a private bathroom containing a tub/shower combination, toilet, sink and hairdryer. The attached mini balcony, accessible via a door, is 15 square feet. 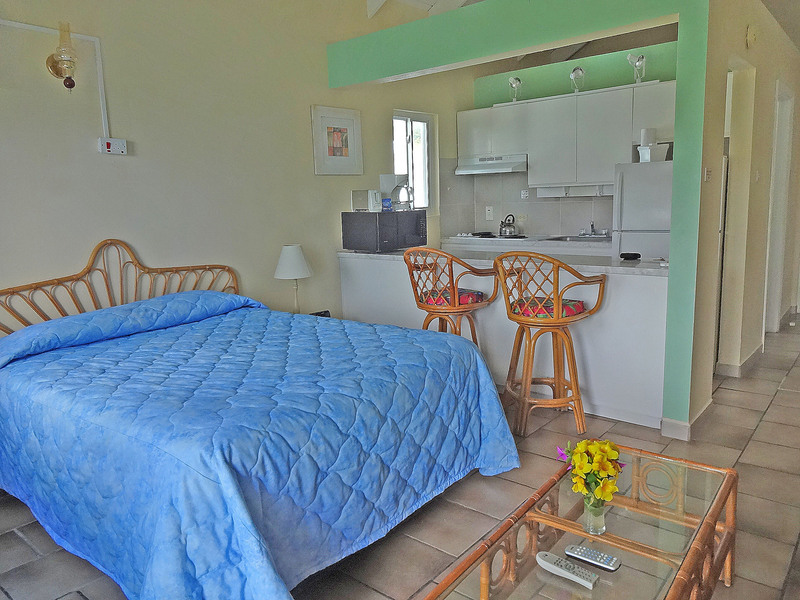 Free Wi-Fi, air conditioning, ceiling fan, cable television, iron and ironing board, tea/coffee maker, mini-refrigerator, clock radio and daily maid service are all included. 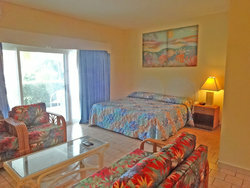 Rooms contain 1 King bed or 2 Twin beds. One child 12 and under may stay in this room with parents on a rollaway bed. Maximum occupancy is 3, consisting of 2 adults +1 child on a rollaway. Mountain View Room - A standard hotel room. These rooms face Timothy Hill and do not have an ocean view. 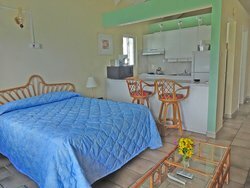 The room is equipped with a mini refrigerator, coffee/tea maker, free WiFi, hairdryer, iron and ironing board, cable TV and phone. From the mini balcony facing the lawn, adorable vervet monkeys may occasionally be seen frolicking before sunset. There is daily maid service.Rooms contain 1 King bed or 2 Twin beds. Mini balcony of the Mountain View Room facing the hillside behind the hotel. Occasionally shy vervet monkeys may be glimpsed frolicking on the lawn near sunset. Modern comfortable room with an Ocean View. This is a standard room measuring 370 square feet with a private bathroom containing a tub/shower combination, toilet, sink and hairdryer. The attached balcony, accessible via sliding door, is about 90 square feet and is furnished with comfortable chaise lounges. Free Wi-Fi, air conditioning, ceiling fan, cable television, iron and ironing board, tea/coffee maker, mini-refrigerator, clock radio and daily maid service are all included. One child 12 and under may stay in this room with parents on a rollaway bed. Maximum occupancy 3 consisting of 2 adults +1 child. Ocean View Room - This room is an upgrade from the Mountain View room and features a view of the Caribbean Sea via a large sliding glass door and front facing window. 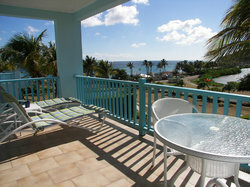 There is an ocean view patio or balcony for viewing Caribbean sunsets. 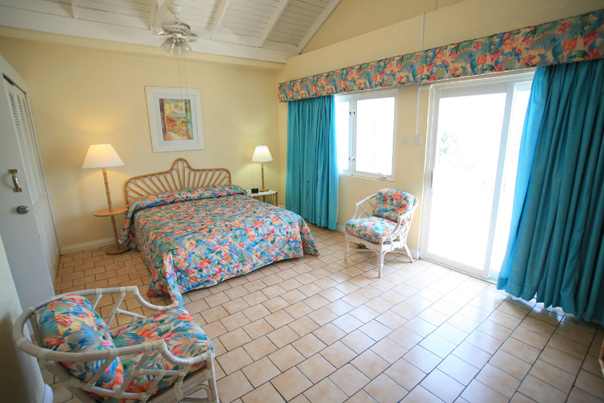 Rooms have King, Queen or Twin beds. 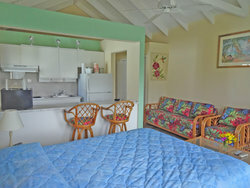 Additional amenities include hairdryer, iron & ironing board, clock radio, cable TV, phone, coffee/tea maker, and free WiFi. 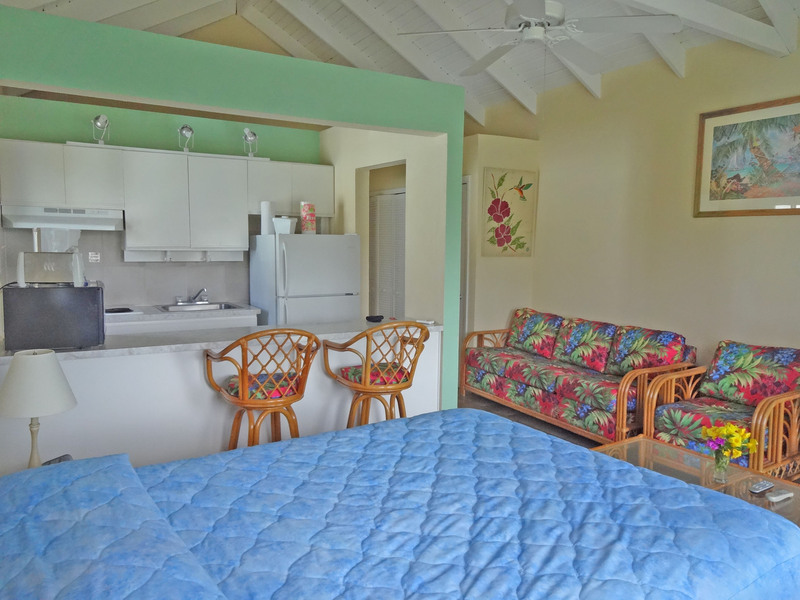 Wake up to a view of the Caribbean Sea and salt pond from this compact room, which also contains a queen bed, living/dining room area, full kitchen with dishes, utensils, stove top, microwave oven, toaster, coffee maker and full-size refrigerator. All have an ocean view balcony or patio. One child 12 and under may stay in this room with parents on a rollaway bed. Maximum occupancy is 3, consisting of 2 adults +1 child. Modern compact room containing a queen bed and kitchen. 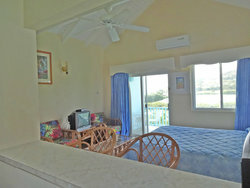 Rooms are located on the ground through 3rd floors, with the best views on the top floor. 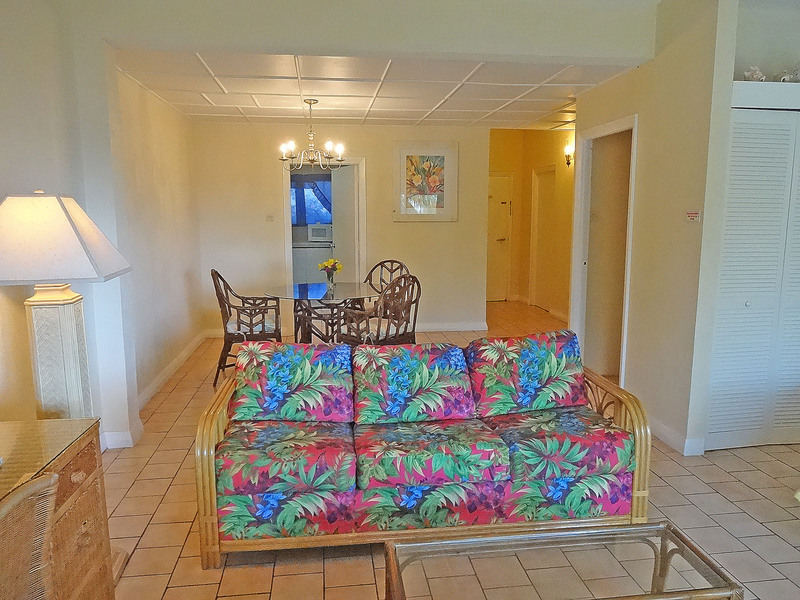 Steps from the beach, this ocean view ground floor room contains a queen sofa sleeper and 2 twins or 1 king bed, living/dining room area, full kitchen with dishes, utensils, conventional stove and oven, microwave, toaster, coffee maker, and full-size refrigerator. This is the only room type which comes equipped with a shower bath only. 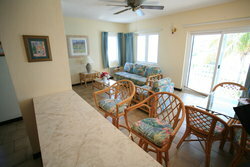 These units are closer to the sea and have a large covered ocean view patio. All large studios are ground floor. Maximum occupancy 4. More than 2 adults pay an additional $25/person/night. Think of this as the perfect suite for that gathering of 4-6 family members or two couples. Stretch out in the large gathering space on the main floor or on the large covered patio as well as on the upstairs spacious sundeck with ocean views. There's also a mini-balcony on the lawn side for viewing shy vervet monkeys frolicking at sunset. These condos are closest to the Caribbean beach. Bedrooms are on 2nd floor. All rooms feature Free Wi-Fi, premium channel cable TV, air conditioning, hairdryer, clock radio, iron & ironing board. The Ocean View bedroom has a spacious sundeck balcony. The Mountain View bedroom has a mini balcony facing the back lawn. 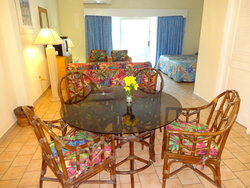 More than 4 adults are $25/person/night additional. 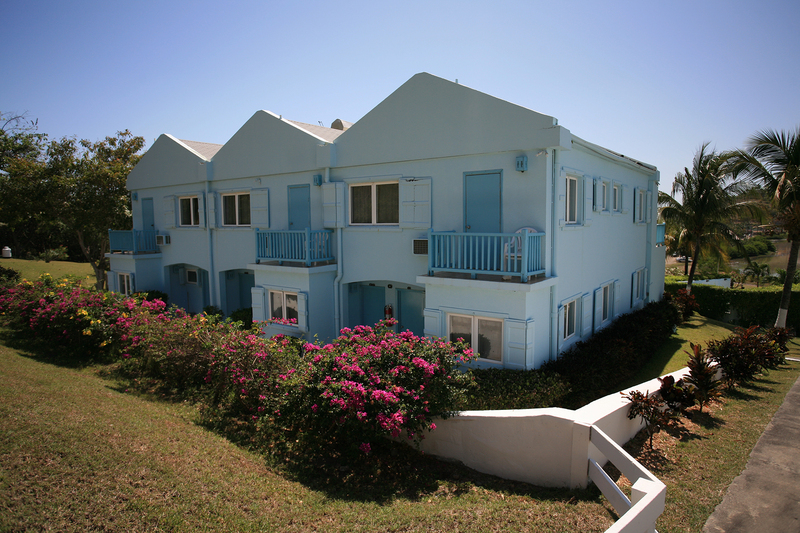 The Ocean View Rooms of our Two Bedroom Townhouses have a 2nd floor sundeck while the downstairs living/dining area has a large covered patio. Faces back of property - Timothy Beach Resort's most basic room. The mini balconies of our Mountain View Rooms are accessible via a wooden door. Although not as spacious as the Two Bedroom Townhouse, there are still two generous bedrooms with a smaller living and ktichen area. 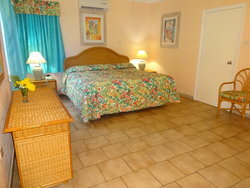 This is an ideal accommodation for two couples or a family group of 4-6 who don't mind togetherness. There are two large balconies or patios with views of the salt pond and Caribbean Sea.. In addition there is a mini balcony adjoining the mountain view bedroom. 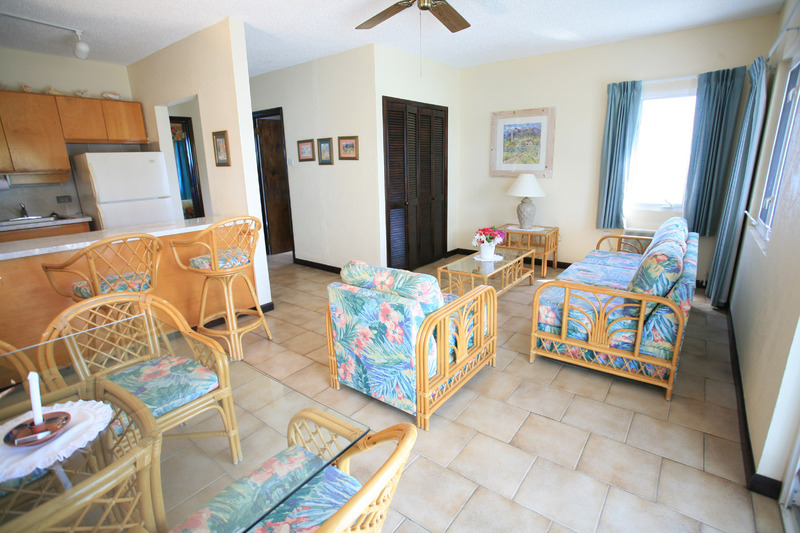 These suites are located in the building 2nd furthest from the Caribbean beach. One Bedroom is Ocean View and the other is Mountain View. 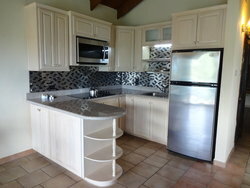 Full kitchen has dishes, utensils, stove top, microwave oven, toaster, coffee maker and full size refrigerator. . 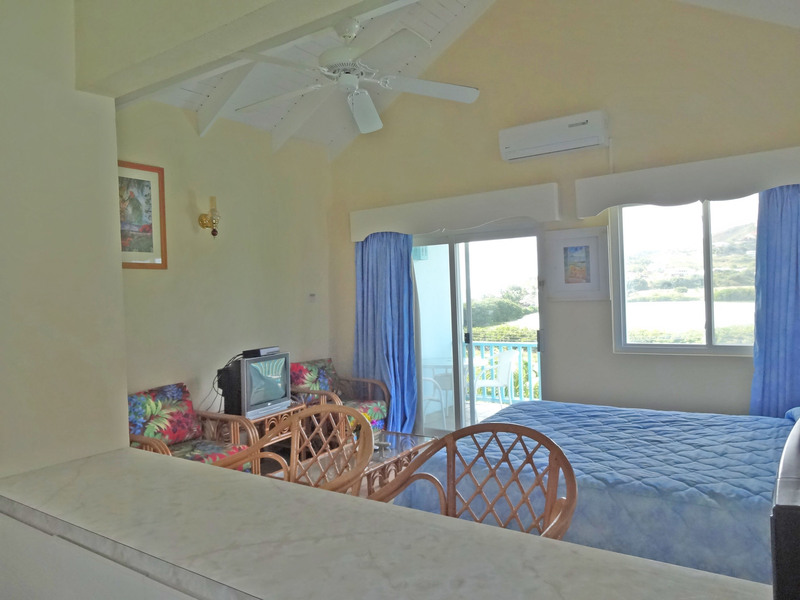 The Ocean View bedroom has a balcony or patio. The Mountain View bedroom has a mini balcony or patio. Located in the next to last building from the sea, the Two Bedroom Suites have two ocean view balconies or 3 ground floor patios. There is one balcony for the Ocean View bedroom and one for the living and kitchen area. There is a mini balcony off of the Mountain View room.